ok, another update here- this one was a bit quicker to do than the Petrol Station, as it's a much simpler design and layout. There are some like this in the STALKER game itself, and again I took cues from them (To retain the feeling) and tried to make them a bit more gritty and realistic. I will be doing a fair few variations of this too, as it's fairly low poly and is easy to mix and match to create a lot of differing layouts, even multiple floors too. 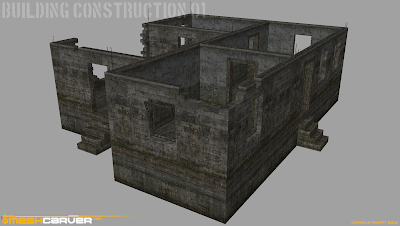 So expect to see some desolate huddles made up of these kind of half constructed buildings scattered throughout NOVA ZONA- the idea being that before the "Incident" the island was starting to become fairly prosperous and was a burgeoning thriving community. Anyway, here's a shot showing some damaged wall section also so expect to be able to shoot through the gaps etc. And also, now with ARMA 3's new and bloody lovely Volumetric Godrays it should enhance the immersion even more. I hope you like it anyway..!